My day job, so to speak, is overseeing the children’s ministry of a local church – Cross Points Church. We call the kids ministry Cross Points Kids. I’m hired to be a children’s pastor, but my job is to lead a team of teenagers and adults who teach kids on a weekly basis. I want Cross Points Kids to reflect the Joy of Jesus every Sunday morning. As I’ve told my team during the year, JOY doesn’t come from ourselves. It comes from a different, heavenly place. 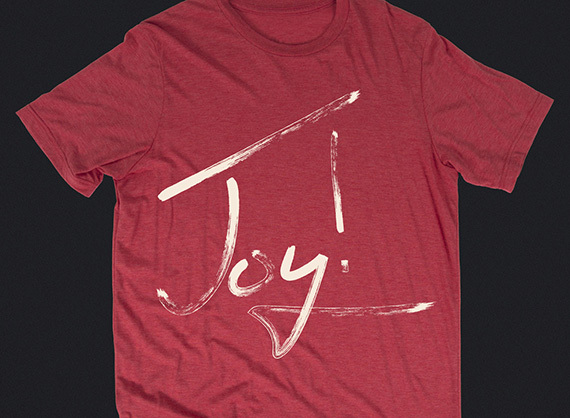 We are so focused on JOY, we wear the below shirts every week to remind ourselves. Based on my brief introduction, what word jumps out at you? The people of Israel went home from this 2 week festival joyful. As I’ve shared with my team, true JOY only comes through the Holy Spirit. We are filled with JOY when we are filled with Him (Galatians 5:22-23). I believe this passage is the Holy Spirit at work in Old Testament language. 22,000 cows and 120,000 sheep and goats were sacrificed as a peace offering to God. That’s a lot of livestock. A few summers ago, I visited a feed lot with nearly 50,000 cattle. The sight (and smell) of acre upon acre of cows was unbelievable. I can’t imagine almost 3 times this amount of livestock being presented to God. However, this sacrifice was not about sin or atonement; it was about peace. This peace offering was meant to bring satisfaction to God, and in turn give satisfaction to the person making the sacrifice. When we give our best to God (142,000 animals!) we find satisfaction. This leads to JOY. The people didn’t celebrate in a bubble. They didn’t dedicate the temple with an online ceremony. They did it together. People from every area of Israel came together for this event. It was a party! When we do life together – the good and the bad – we experience JOY. Trust me, as an introvert, this is hard to write. I want and need my time alone, yet just as much, I need to be around real people doing big things to find life. The reign of Solomon was much different than the rule of his father David. David’s life as king was filled with battle and blood. Comparatively, Solomon lived a life of peace. We see the first fruit of this new era of peace in Israel – JOY. We all are in different phases of life. Some life cycles are more chaotic and others less, but no matter the level of chaos in our lives, we can have peace. Jesus is the Prince of peace. When we allow Him to control our lives, we find peace. Peace helps us experience JOY. Satisfaction, community and peace don’t guarantee JOY, but they do lead us down that path. And remember the giver of JOY is the Holy Spirit. It is through Him we experience true and lasting JOY. ← Advent | The Word | It’s Alive! !